The ever-reliable powder room accommodates all of these and more. 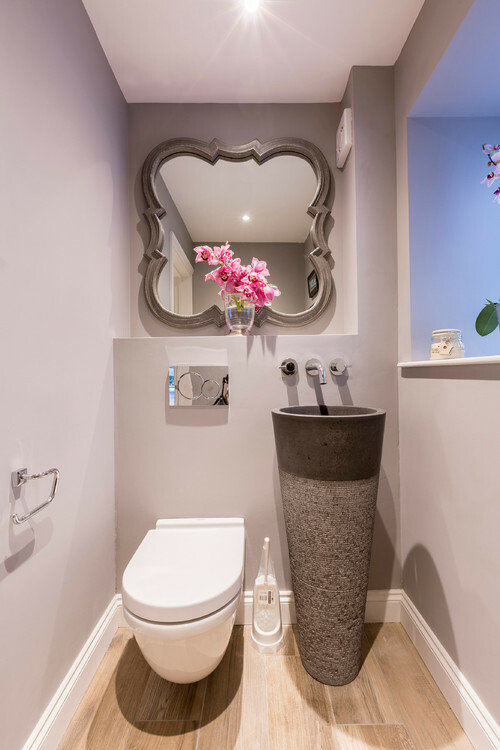 Think about it: A well-styled washroom, no matter the size, is key to a well-balanced home. 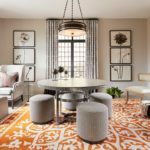 As an essential part of the house, the space gets constant traffic at all hours, particularly from visitors and overnight guests. I like to turn powder rooms into little jewel boxes. Someone once told me that if you want to know the quality of a restaurant, check out its bathroom. That has always stuck with me. You have a captive audience in a powder room, as they are most likely alone. The basic nature of powder rooms—primarily the small square footage of the room— is an opening for great design choices, not a constraint. A restricted number of light fixtures, square feet of tile and amount of wallpaper needed = creative freedom for maximum impact. 1. Every surface is an opportunity. 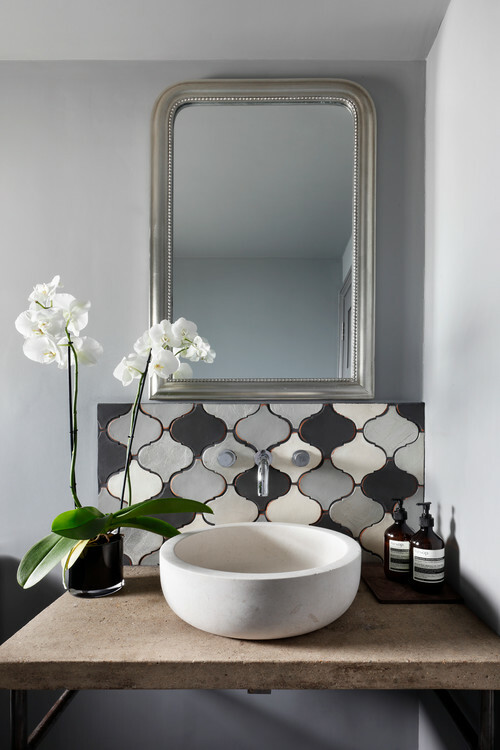 If you love a wall covering or stone but are deterred by the price,work it into a smaller space such as a powder room.The square footage of powder rooms is typically so small that that you can let mosaic tiles shine or use leftover feature tile from another bathroom. Smooth and easy-to-clean stone surfaces are the way to go. If you want elegant, marble is the tried-and-true hero of any luxe aesthetic. Smaller tiles of the stone can deliver eye-catching slices of grandeur, while larger scale options show off the stone’s natural grain. 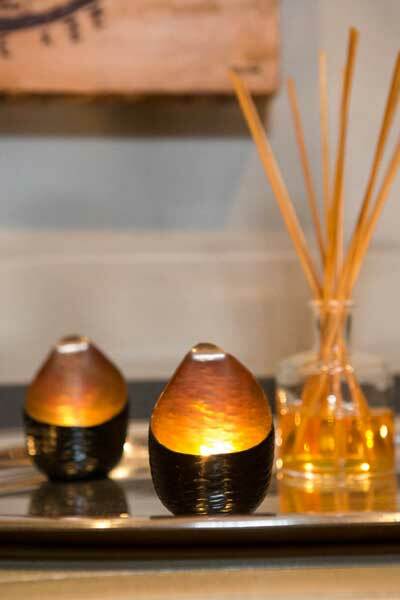 Black marble conjures up dark, rippling water, perfect for a more dramatic moment. Glittering mica or mature travertine limestone are equally chic alternatives. And with a modern wall-mounted sink, you can forgo the classic countertop entirely, and leave the embellishments to the floor or walls. 2. In a room this small, it’s all in the details. One of my no-fail tips for any bathroom: Put a tall, thin bud vase with a fresh flower, and light an amazing candle. Simple, yet completely effective. 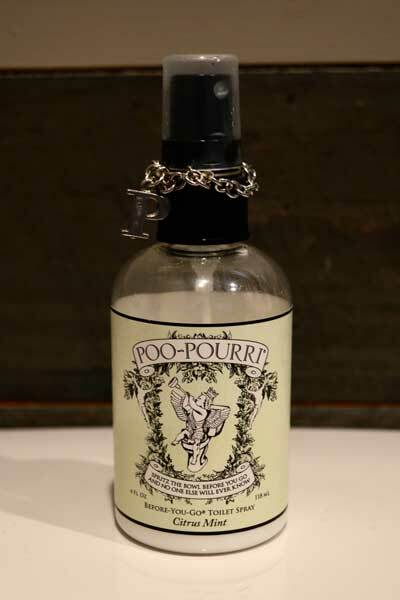 Accessories can really make a room, so opt for freshly scented soap (we like Molton Brown), Poo-Pourri toilet spray (you will love their cheeky marketing), and some elegant hand towels. 3. A good sink is essential. 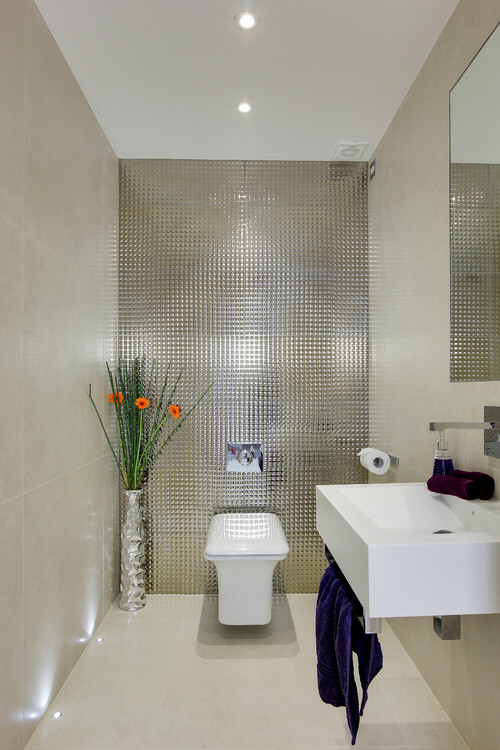 As noted above, a wall-mounted sink is a sharp and statement-making fixture that can save space in a small bathroom. Select your plumbing with care and show off the faucetry’s industrial vibe (our Senior Designer Samantha Lanza coined the term faucetry to encompass all the decorative plumbing that’s seen as opposed to the in-wall plumbing that’s not seen). When there’s space for a counter, I prefer an undermount sink for a clean edge that highlights the stone. A thick, square-rimmed sink is a minimalistic dream come true. 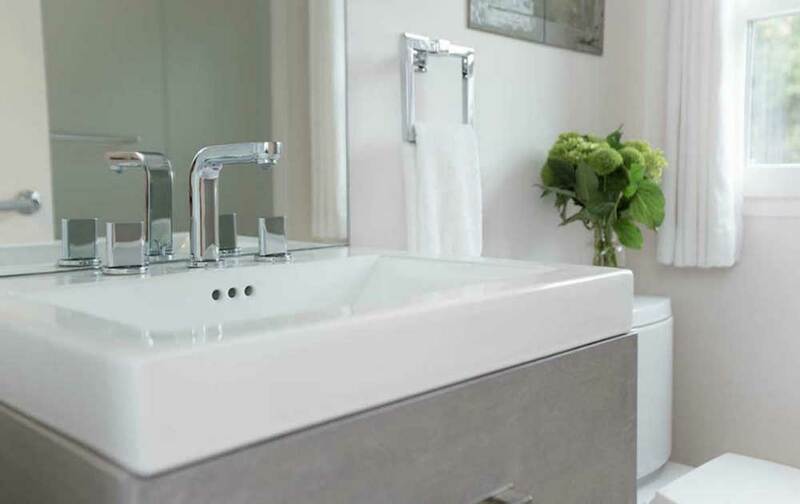 The classic pedestal sink is the traditionalist’s best friend, perfect for a more classic vibe. Vessel sinks, also known as bowl sinks, sit on top of the counter and are often characterized by bold basin designs and an unusual (and beautiful) range of materials. From burnished, stately bronze to vibrant, tempered glass, a vessel sink is an ideal way to add intensity to a powder room. 4. And now, for the toilet. This piece of plumbing may not be the most glamorous topic of discussion, but it is certainly one of the most important ones. 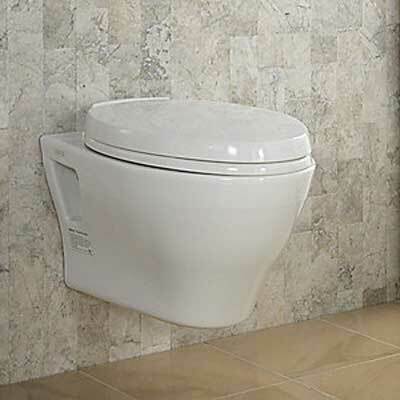 Wall-mounted toilets are great for small spaces and for test-driving the modern trend. They’re especially fun if you’re doing a cool floor as they don’t distract the eye. Our top pick: Toto. 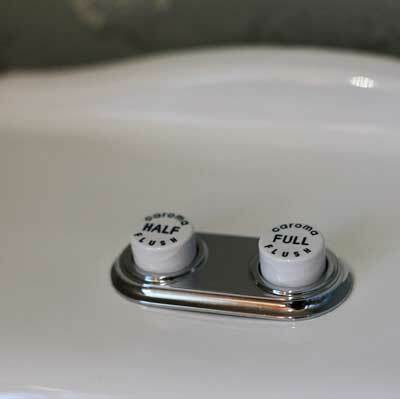 Another great eco-friendly trend we’re seeing is dual flush toilets for water conservation. 5. Window treatments are a powder room must. The goal is to provide enough privacy while still letting in as much light as possible. I’m liking top-down, bottom-up woven woods and café curtains for this. Shutters are another great way to go. You have ultimate privacy, but can tilt the shutters to still let in light. Also, I love the look of shutters just on the bottom half of the window. If you are going for a more streamlined look, try fabric inserts into a shutter frame instead of the louvers. This look can also be traditional with a more detailed frame, beautiful hardware and a classic fabric. Flat roman shades are a simple treatment that let the fabric be the star. I like to layer a roman shade valance over wood blinds when both privacy and softness are required. Adding fabric to a powder room is always a plus since most of the surfaces are hard. The ultimate luxury? Fabric upholstered walls—great in a powder room that has wainscoting three quarters of the way up the wall, to be completely clear of all plumbing. 6. Don’t leave your guests in the dark. Choose lighting that speaks to your home and personal style. 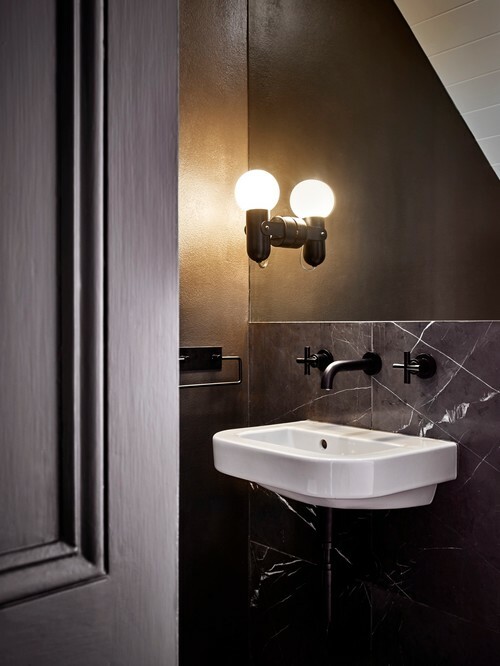 You should illuminate your powder room to reduce shadows and glare so that mirror checks are quick and simple (no need for counter climbing or squinting!). 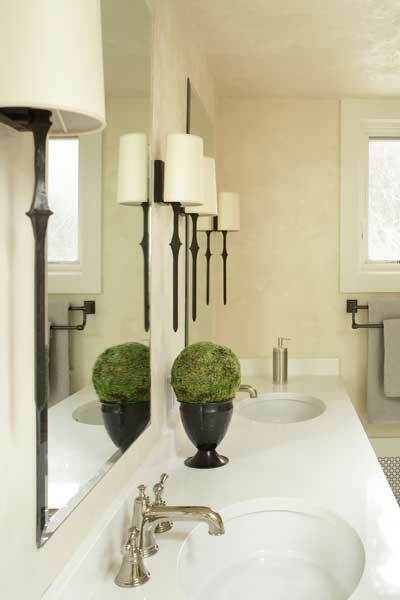 Be it sconces or recessed lighting, the choices and materials are endless. 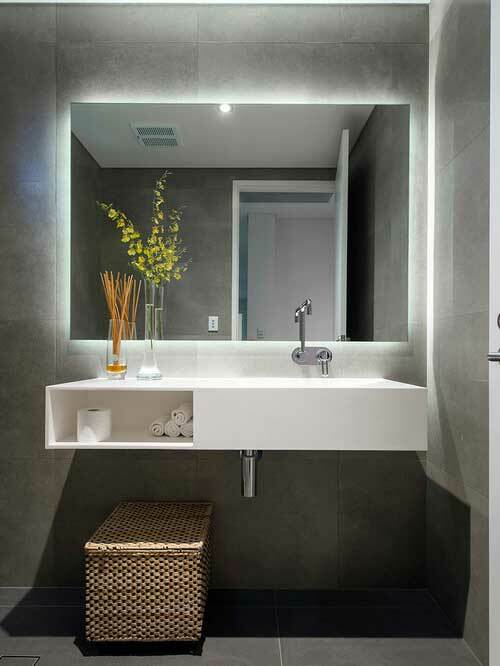 From a design standpoint, framing the vanity is a classic way to provide an even diversity of lighting angles by removing the harshness of a singular source. By flanking your mirror with sconces or other wall-mounted pieces, you can add a note of regal charm while opening up the space in an inviting way. If you have a high ceiling, pull the glow back down with a beautiful pendant. Layering your lighting is key to achieving an interesting and Zen—like ambiance. 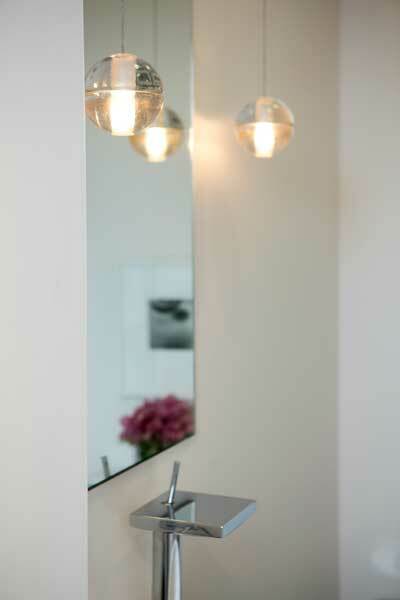 One of my favorite tricks is to position a small recessed light directly over the sink basin to bounce light back up. It’s amazing how much better everyone looks when they are lit from multiple angles. 7. Let’s take a moment to reflect on mirrors. If you’ve ever been in a bathroom that lacks this essential glass companion, you’ll understand how important it is to the space. The mirror’s function is twofold—for all-important personal grooming, but also to make the room appear bigger. 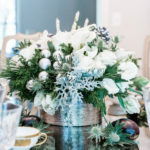 Your guests will undoubtedly be peering into it, so make it count. The market on mirrors is generally sorted into framed and unframed pieces, and it’s up to you to decide what style will better complement your home. A frame offers a crisp, customizable edge that can suit any color scheme or thematic desire, and is currently a popular choice on the interior design scene. Especially trendy are molded trim borders, which look great while stylishly integrating the mirror into the room. However, for a floating, understated feel and a wider freedom of shape, a frameless look is not at all without merit. Beveled edges can provide an effortlessly airy, faceted charm, perfect with any palette. Beyond that, the possibilities are endless. 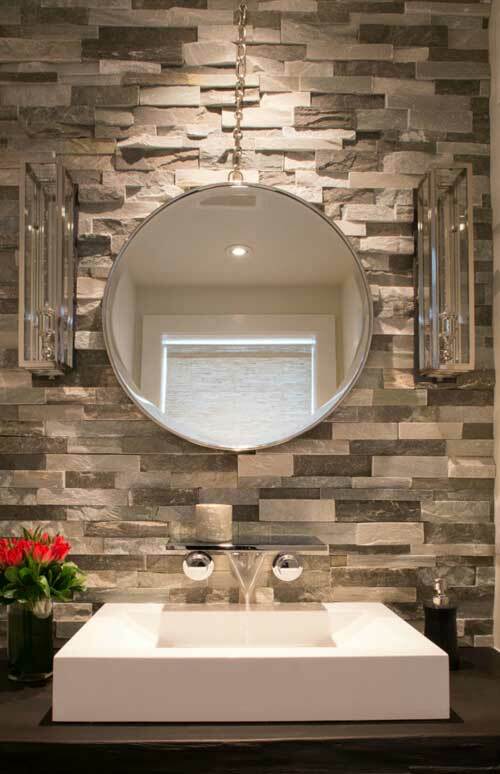 A wide landscape-style bathroom mirror is accessible to everyone, while a set of twin or triple mirrors adds a pleasing vertical aspect that breaks up the room. For a period sensibility, an oval shape is the way to go, especially if it’s framed. 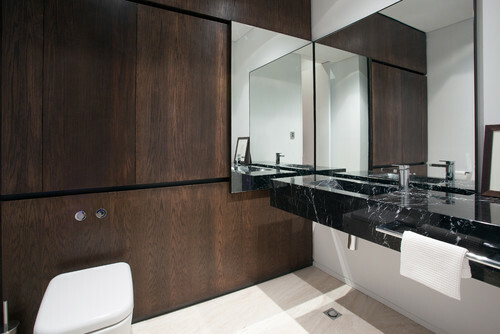 But a mirror is a great springboard for an abstract or contemporary design aesthetic as well. 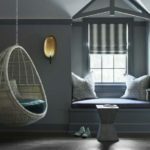 Don’t be afraid to experiment: There are a lot of great designs incorporating futuristic inset lighting, interesting shapes, and exciting materials and functions. 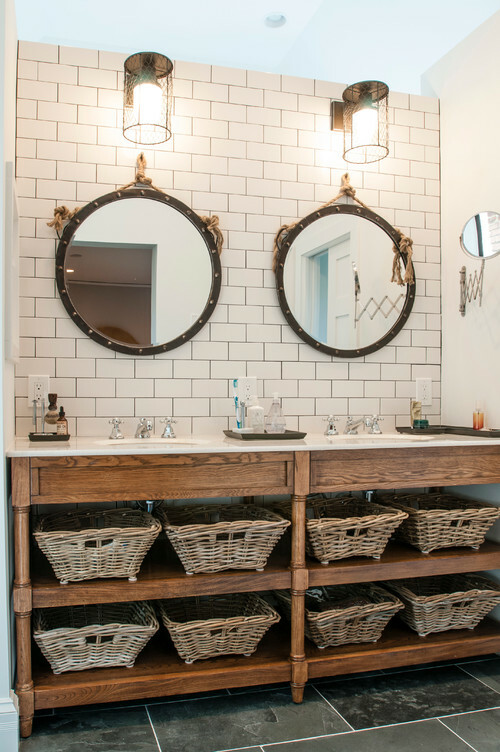 Sneak a medicine cabinet into your powder room if you can. As a host, it’s always good to have lipgloss, mouthwash, and Advil handy. 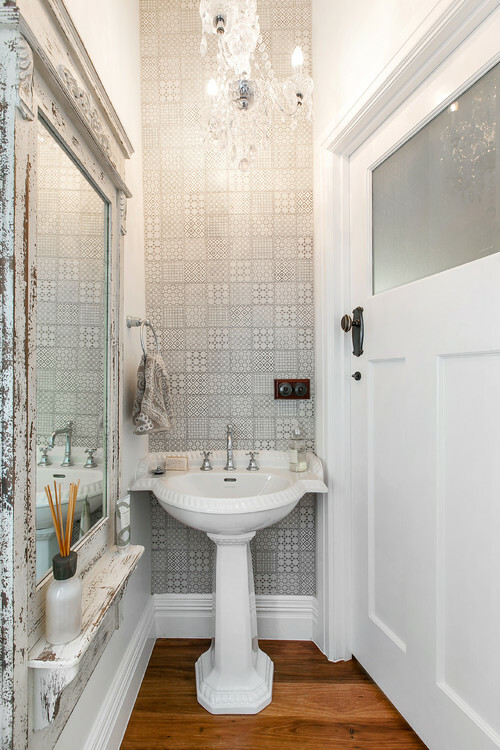 So there you have it, our ode to the timeless powder room; the small, unsung hero of the home. If you’re looking to inspire your visitors, styling this space is just as important as decorating the guest bedroom, if not more. The room’s small size allows you to pack more punch per square foot while stretching your budget. So go ahead and craft an absolutely glamorous, dreamy powder room space that is sure to impress family and friends for years to come. 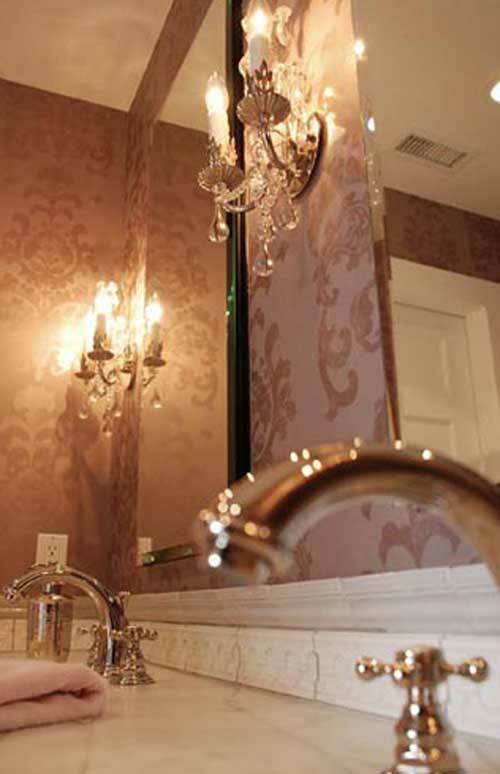 What if House of Funk could design your powder room? We’re celebrating our ten-year anniversary with the launch of our luxury online interior design service, a digital approach to our signature interior design service. Want to know more? Click here. Decorate your powder room like a pro. 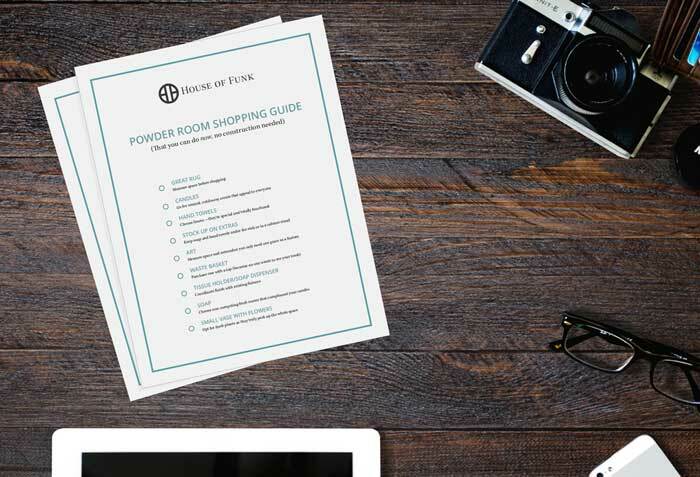 Download our printable powder room shopping guide. powder room décor like a pro. 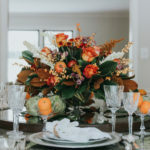 Set your Thanksgiving table like a pro!